Sun damage, acne, and age can leave your facial skin looking dull and weathered. If you’re dealing with these issues, the expert team at Arden Wellness Body Contouring in Hauppauge, New York, can help you look your best with microdermabrasion treatments. Microdermabrasion is a minimally abrasive skin care procedure that removes the damaged outer layer of your skin to reveal the healthier, glowing layers underneath. Get rid of dull, tired skin and feel more confident about your appearance. Call Arden Wellness Body Contouring to schedule an appointment or request the next available time online. Microdermabrasion is a non-surgical, non-chemical approach to skin rejuvenation. The procedure uses a handheld device and microcrystals to remove the outer layer of your sun-damaged, aged, or acne-scarred skin, revealing a healthier, brighter layer below. When dead skin cells settle on the surface of your skin, your skin looks dull and dry. Microdermabrasion reveals the newer, healthier layer below and also encourages the production of new cells that contain elastin and collagen. You need elastic and collagen to improve your skin’s appearance, and keep it looking smoother and firmer, but as you age, your body produces less of these components. Microdermabrasion gently stimulates your skin to rejuvenate itself in the weeks after treatment for continued visible improvement of skin tone, fine lines, and acne scars and blemishes. Men and women who want to revive their skin and improve tone and texture while taking care of these types of skin concerns are often quite pleased with the noticeable results from microdermabrasion treatments. The skin care experts at Arden Wellness and Med Spa customize a microdermabrasion treatment plan that delivers long-lasting results. For many women and men, this means two microdermabrasion treatments spaced a few weeks apart, then potentially one session each month to maintain your rejuvenated, healthier-looking skin. The goal of treatment is to provide you with the results you desire, so your provider advises you regarding an ideal number of sessions during your consultation. Generally, you’re a good candidate for microdermabrasion if you’re in overall good health with relatively minor skin conditions. 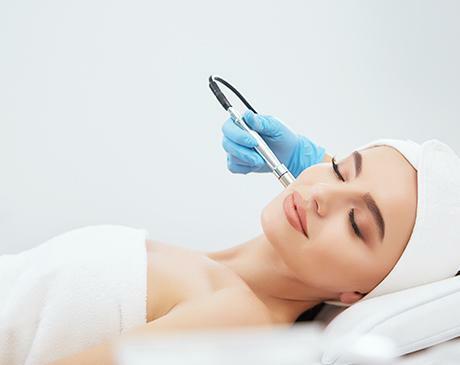 Microdermabrasion can correct minor imperfections and create healthier skin, but it can’t tighten sagging skin or correct deep scars or creases. Find out if you’re an ideal candidate for microdermabrasion treatments by calling Arden Wellness Body Contouring for an appointment or scheduling a consultation using the convenient online booking tool.